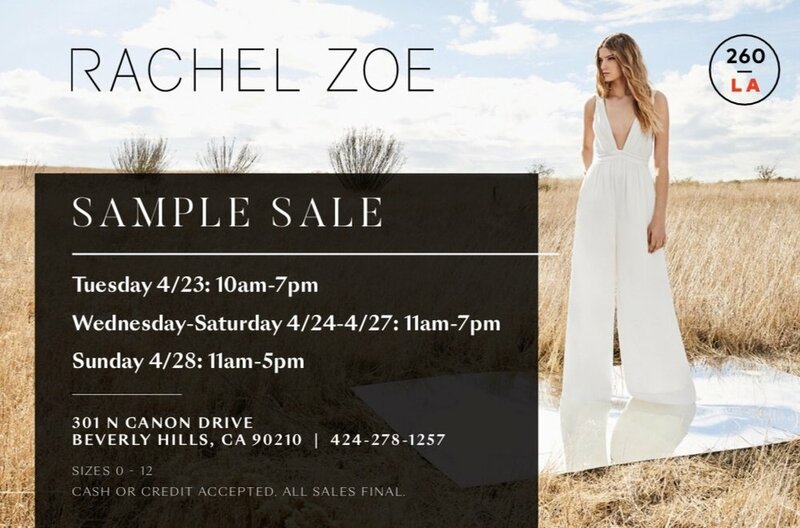 260La is excited to welcome the Rachel Zoe sample sale to our 301 N Canon Drive location in Beverly Hills. Join us Tuesday, April 23rd though Sunday, April 28th to shop discounts on women's ready-to-wear apparel & accessories from this trendsetting fashion brand at prices far below retail. "Her clothing label has only been around since 2011, but Rachel Zoe has been a fixture in the fashion industry for over two decades as an editorial and celebrity stylist. All those years of professionally putting together beautiful outfits are what makes her designs so strong. She parlays an innate understanding of fit, and a deep obsession with vintage clothing into her designs, like her signature Rachel Zoe dresses, jumpsuits, and wide-leg trousers. You can always count on her collections for mix-and-matchable classics with superbly flattering cuts, luxe materials, and just enough glamorous details to stand out."